I think it's pretty clear that February is the month of Love. 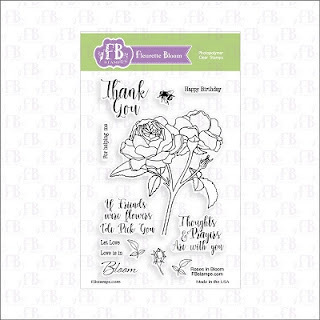 And I'm back again with Fleurette Bloom Stamps... whom has just asked me to be a part of their Design Team!!! Eeeeeek!! How cool is that??!! I don't know about you but hearing great news like that always make me feel loved! And I've been in a very lovey-dovey type of mood lately... lots of warm fuzzies! 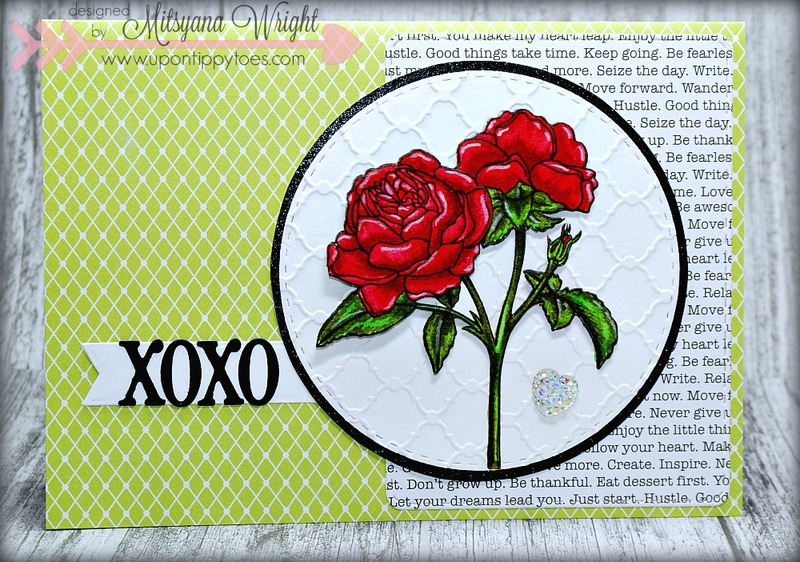 And what says love better than red roses...I think roses are very romantic, by the way! I started by stamping my image with Momento Tuxedo Black ink, a total of three times. Next, I colored them using Kuretake's Clean Color Real Brush Pens and I added highlights using a white gel pen. I cut out two of the images by hand, and the third I die cut using a stitched circle die. Then embossed the die cut with an embossing folder. 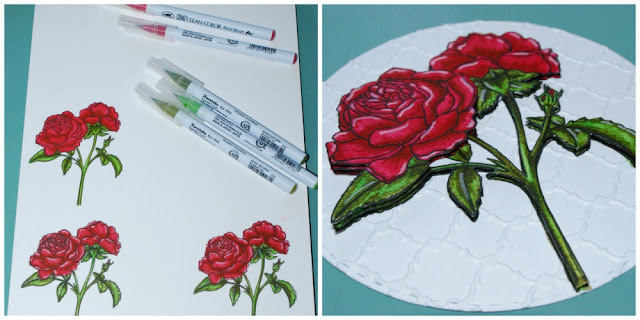 I added foam adhesive to the back of the flowers and layered them onto each other for more dimension and removed one of the flowers for the very top layer. 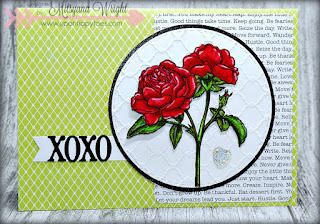 I used this light green paper from the Hello Darlin Stack by DCWV and created a A7 (5"x 7" folded) sized card base. Then die cut printed text paper from the same stack using a stitched rectangle die. You can hardly see it but the print has lots of inspirational sayings and phrases. 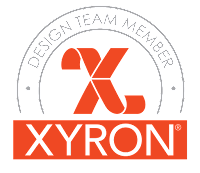 I used my Xyron Mega Runner to attach my rectangle to the front of my card base. 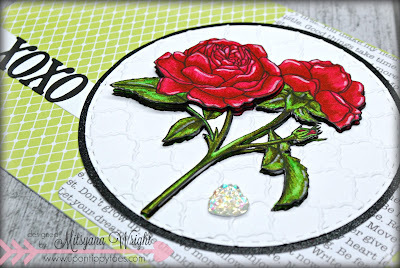 I used the same circle die from earlier and traced around the outside diameter of the die as a template. 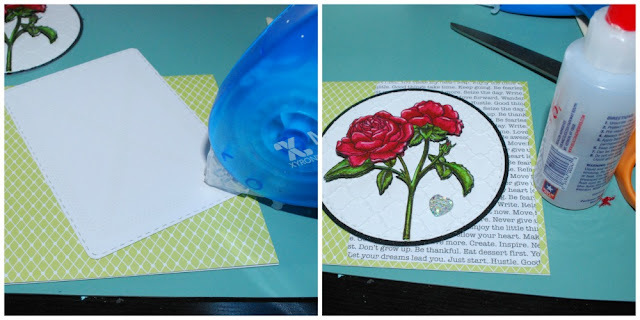 Then hand cut out the traced shape and layered it under my paper pieced roses. I added foam tape under the circle for more dimension then adhered it to my card front. I die cut a pennant and the letters XOXO and adhered the little flag to the card, slightly tucking it behind the circle. Lastly, I added a heart shaped cabochon using a clear quick dry adhesive. You can really see all the added dimension with all the different layers (above picture). a bit of love, a little romance, or even some heartfelt inspiration. Eeek! Thank you, Fleurette !! !❤ I'm so excited to finally spill the beans!! It's beautiful, Mitsy! 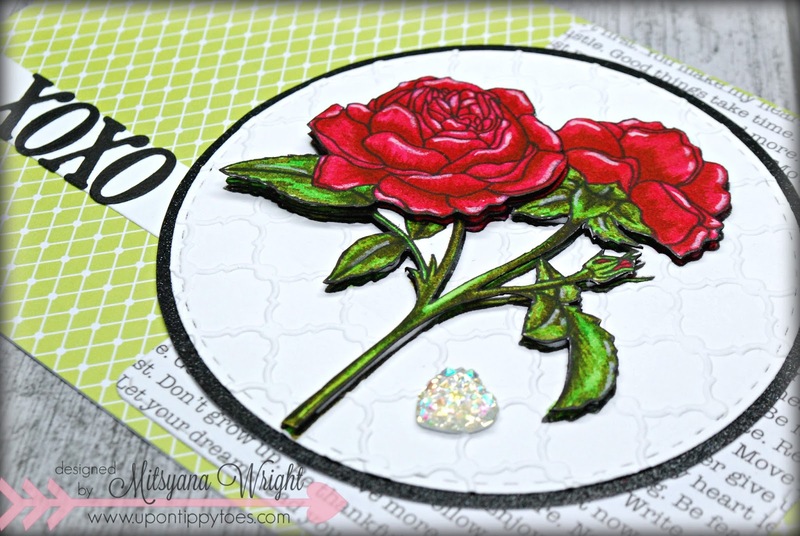 I just love how those bold colored roses pop right off the card. Congratulations on your latest gig! :) You're a busy girl! Beautiful card, Mitsy! 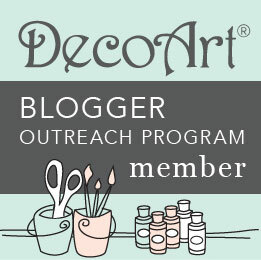 I love the colors and dimension! Congrats on your DT spot! 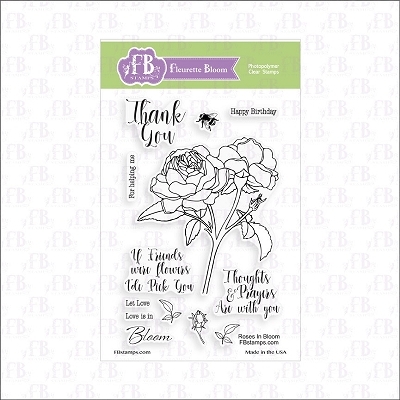 Beautiful flower stamp, beautiful coloring, beautiful card.